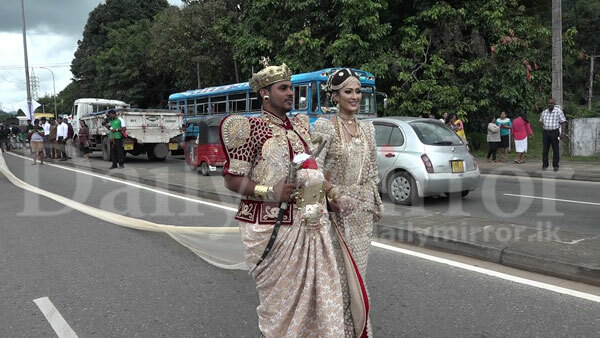 More than 250 students of Alwathugoda Sarath Ekanayake Primary School lined up along the Gannoruwa–Kandy road today to display a three-mile long bridal Sari worked by a beautician who claims it to be the world’s longest Sari. She is hopeful of setting a Guinness world record for her work. 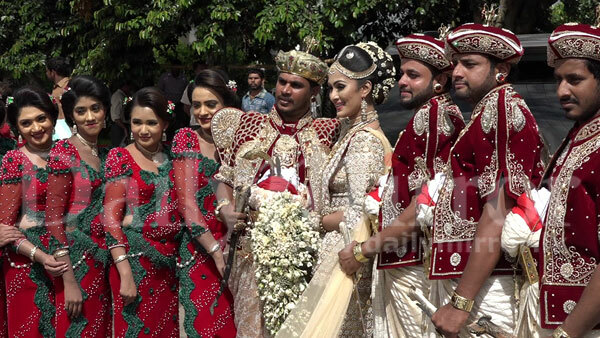 Several other students posed as flower girls in the event held in the form of a wedding. The display held under the patronage of Chief Minister Sarath Ekanayake created heavy traffic congestion compelling the police to deploy a contingent under SSP N.M. Sisira Kumara to control the traffic. And they shutdown a main road for such idiotic fantasies. Use school children during schooling hours. ONLY IN SRI LANKA !!! !Way to go people !! How stupid ! Jobless, aimless, useless!!? Can't they put their time and money to better use? Absolutely dumb. Reminds me of those Gulf Arab idiots building the most expensive toilets or those stupid Indians putting up a statue for Patel worth several million crores. Dumb and Dumber! School children should not be taken to roads for this type of things. Chief Minister is giving a bad example. 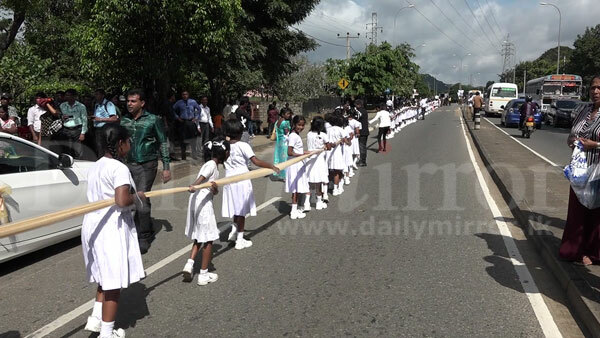 little unusual in Sri Lanka.But if its in India its a common thing to go behind guinness records.may be it disturbed life of many because of traffic.but people should try new things.obviously the students who helped to process learnt new things on a how guinness record is evaluated.great work ..good luck ! Seems to be not having any worthwhile work to do. What an idiotic POMPOSITY? Chief Minister has nothing else to show the upcountry people. I feel sorry for the school children. This is appalling. @ the expense of school children during school hours! Is this the type of education, and values we give our children? Absolute misuse of position, power, and this is the type of politicians we have elected for the high offices to rule the country. Stop this rot. Is it possible to file a case against the culprit/s? Didn't these politicians have any fruitful thing to do? This bridal beautician thing is big business now where yakaas are transformed into angels, and public money is wasted for these politicians entertainment. ! Hon. Minister. Akila Viraj, is a very unbiased personality. He should take stern action against even with dumb Sarath Ekanayake and the Principal for using school children .. These poor kids (in the hot sun) cannot be used for these nonsensical acts. I am sure they have not taken permission from the Education Ministry.... very disappointing.. This school is coming under the purview of Central Provincial Council Education ministry. This is not a World's longest saree, but long piece of cloth. Waste of time and money, and officials organized primary school children to this kind of stupid activities need to be queried. Sarath E is completely jobless. Niluka E should take action against this idiot of a CM. Madness gone to its most extreme end. I never expected this from CM. How foolish you are? Now a Hollywood actress will say ``Wooooooow`` and the whole Sri Lanka will start crying for throwing bad comments on this. What and Idiotic act, feel really sorry about the school children, wonder they were given some refreshments? Even Buddhist Priests have participated. symbol of stupidity. Any stupid avtivity you can be sure of the presence of this tribe. What an avalanche of stupidity displayed by the educated, and religious adults. I am proud to be a member of a new species that is developing in this nation... Mad-Sapiens.This should result in a failed attempt. I feel really very sorry for the kids and their lunatic parents and teachers. ARE KANDYANS SO FOOLISH? SUDDHA GALA VIDDE NETHNAM OJE.. OJAAYE.. These are the stupid politicians in Sri Lanka displaying theirstupidity in public. Chief Minister has no something better to do for the welfare of masses, Valuable study time of school children wasted on the road. Shame on you Mr. Minister. Why Involving Innocent School Children ? What A Crime . Minister of Education has to take firm action to protect school Children getting involve from these kind of stupid Activities. Could have avoided all the problems , If you got all the gustes to hang on to the Sari pota.